Event promotion is all about generating buzz. Social media can get that buzz going before your event even starts. Want your attendees to stay active and excited during your event? Then displaying live tweets is the way to go. 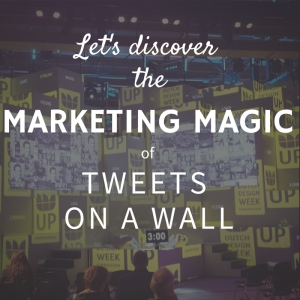 I’ll explain why a Twitter Wall is the most effective (and fun) marketing tool for your event or brand. 1. What is a Tweet Wall? Let’s first see what we’re talking about. What does a Tweet Wall (or “Twitter Wall”) do? With TweetBeam’s Tweet Wall, you can showcase live tweets in an appealing way. Just pick a hashtag, and tweets with that hashtag will pop up instantly on your own Twitter Wall. That doesn’t only sound fun. It is! 2. How can a Tweet Wall promote my event or brand? A single display can have an immediate impact on your next event. Here is how it works. You display Live Tweets around your event, product or service on a big screen at your event / business. The Tweets displayed catch the attendees’ attention. They are entertained and triggered by the online discussion about your event or brand. The Tweet Wall also stimulates attendees to tweet about your business or event hashtag. It’s exciting to see your own message or picture pop up on the big screen. People also see tweets of other attendees appear, and will be stimulated to react on them. A Twitter Wall connects your attendees with each other and helps to build a strong event community, that will be excited to attend your next event. All those tweets will make you get noticed.Your attendees will generate exposure for your event in a natural, fun way by spreading your event hashtag to their followers and throughout the whole Twittersphere. It makes your attendees become your event promotors. People who didn’t attend will be exposed to your brand message. For internet marketeers, this form of advertising is known as ‘brand impressions’. 3. What kind of events/brands can benefit from a Tweet Wall? Exposure is golden, for all events and brands. Luckily, a Twitter Wall can be used in plenty of ways, for all kinds of events and brands. events like festivals, conferences, exhibitions, award shows, etc. Just display your live Twitter stream somewhere people can easily notice it. A big screen at an event, in a store or in a lobby, for example, is perfect. Whether you want to promote an event or generate more exposure for your brand: we can help you out. A Tweet Wall gives your event/brand a voice. It generates great and immediate publicity, while also offering the public a unique, unforgettable experience. Want to get the buzz going? Test our features, and get in touch! We love to help.